Wyndham Street. It’s a bit of a mixed bag. The likes of Hooters rubs shoulders with establishments of more class such as Stockton and Ori-gin. Joining them is New Punjab Club, a restaurant that focuses on dishes from the Punjab region of India and Pakistan, which centres around tandoor oven cooking rather than thick curries. Styled with intricate rattan details, patterned walls and Indian and Pakistani artwork, the atmosphere is of a mid-20th century post-colonial Punjab gentlemen’s club. Helming the kitchen is chef Palash Mitra, formally of one Michelin-starred Gymkhana in London. As we peruse the menu, to the sounds of a quirky playlist, a cheeky chappy waiter wheels over the gin and tonic cart with a wry grin – we weren't planning to drink. He's not having it. Once we’re done whetting our whistles with these mellow apéritifs (the drinks start from $138), we order a samosa chaat ($98) and tandoori machli ($218) – cobia fish with tomato chutney. The samosa chaat is comforting, smoky and creamy all at once, the smashed samosas are smothered in a tamarind glaze and yoghurt, with satisfying pop provided by pomegranate seeds. It's also pleasantly spicy, something of a rarity among similar restaurants in Hong Kong. The oily fish is simply delicious, coated in a thick and fatty charred skin that hides buttery meat. The chutney is a little bitter, so we steer clear of it and let the fish shine on its own. 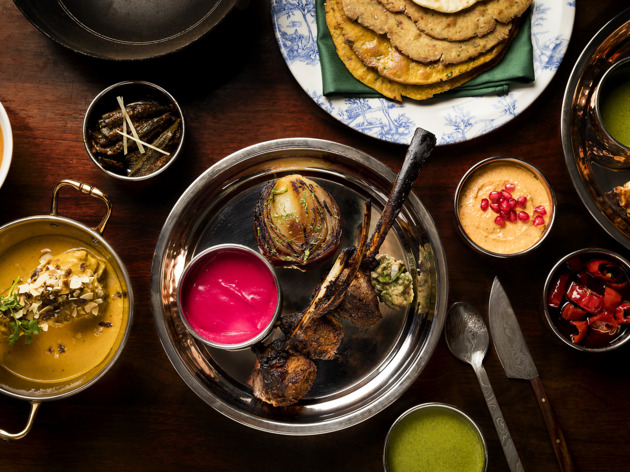 For mains, we go for the murgh tikka angar ($248) – yoghurt and spice marinated chicken – masalewali chanp lamb chops with beetroot korma ($468) and sides of mogewala paneer ($168) and keema naan ($48). The chicken is decent but it’s outshone by its tablemates. The stunning chops can easily serve four, somewhat justifying the hefty price tag. 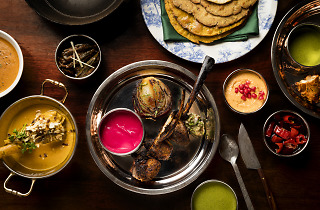 Though not for those who prefer their lamb pink, the tandoor charring cuts through the lamb’s grassiness and the beetroot korma helps enhance the flavour. The paneer – spiced fresh cheese with mint chutney, cardamom, yoghurt and peas – is another good side dish, bearing the compact, bouncy texture a good paneer should. The simple naan is fluffy, packed with moist meat and holds together well. With room for dessert – the food here is filling without being grossly heavy – we finish with the confoundingly smooth nimbu lemon posset with raspberry sorbet ($98), which is a sweet and refreshing end to a very enjoyable meal. We love New Punjab Club. All the elements combine masterfully to create a great experience. Although the pricing means we won’t be able to venture here often, we plan to return whenever our wallet allows. Given the description and positive reviews, was keen to try this place. However, was disappointed to discover that even for a late weekday evening dinner, the restaurant policy (as per their website, and confirmed by call to restaurant) is that diners are asked to leave their table after 90 minutes (on a weekday evening, for a 10pm dinner reservation??). As we'd hoped to celebrate a special occasion, this was a deal-killer, so we booked elsewhere. Frankly, this clumsy sort of "maximize turnover & revenue at every turn" policy strikes me as self-defeating in general, as it tends to discourage diners from returning (or even coming in the first place). Certainly several work friends I mentioned this to agreed. Just wanted to share this regrettable restaurant policy in case other potential diners hoped to have a relaxing, unrushed dining experience.